We think of the word “perfect”, and we think of the optimum, the ultimate, the absolute best. So, it follows that when we think of “perfectionists” we think of high achievers, high performers…you know, successful people. Nobody thinks of perfectionism as negative. But it is. Perfectionists exhibit many self-defeating behaviors. They think that unless they do something perfectly, they are a failure. Since they are human, and rarely do things perfectly, well…you get the picture. Then they try to make up for their low self-esteem by accomplishing things. It can be a very destructive cycle. Only…it doesn’t LOOK destructive to the outside observer, or even FEEL destructive to the perfectionist. Because our society places so much importance on achievement, as long as we are accomplishing things and being successful, everything is good, right? Well, not really. 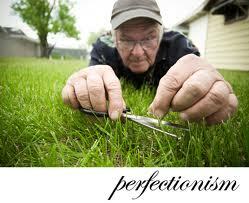 What goes on inside the perfectionist is a problem. The amount of stress that they place themselves under to perform perfectly under any and all conditions is enormous. So enormous, in fact, that often they will not bother to do something unless they think they can do it perfectly. A lot of opportunities get missed that way. And, have you ever met a happy perfectionist? You know, a peaceful, calm, satisfied perfectionist? I didn’t think so. And their unhappiness can carry over into other aspects of their lives. Their self-esteem gets eroded. Mental health deteriorates. Relationships suffer. So, if any of this sounds familiar, it may be time to examine your own thoughts and behaviors. And ask yourself, would you rather be happy or be a perfectionist? ← 50 Shades of Grey or Shifty Plays of Lay?